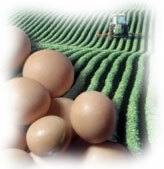 BioFlex Hybrid Foam is a more environmentally friendly alternative to the conventional mattress foams because it replaces up to 50% of the petrochemicals used in foam production with environmentally friendly and renewable soybean oil. This patented process called EnviroFlex improves the foam's core structure, thus creating a more supportive, resilient and comfortable mattress foam. Bioflex offers a superior performance over conventionally produced mattress foam while doing so in a manner that uses only 50% of the fossil fuels used by conventional foam mattresses. 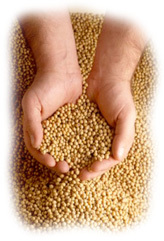 At our store we have a dedication to the environment that extends to supporting the American farmer, by buying American grown soybeans & utilizing soybean oil into our foam mattresses. 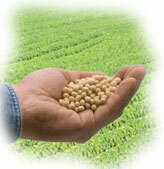 This is not only good for the American Farmer, lowers the CO2 emissions made from the transportation of our ingredients. Good stewardship of the Earth goes beyond buying organic. When we can purchase products made locally we save money from transportation costs and save the environment by reducing fuel consumption. We understand this and the fact that a strong local economy is created when American Farmers and American manufacturers like The Futon Shop work in tandem to implement the latest green technology for our customers. • Lessen dependency on fossil fuels including foreign crude oil. • 23% reduction in total energy demand. • 61% reduction in non-renewable energy use. • 36% less global warming emissions. • Results from Preliminary Life Cycle Analysis by Five Winds International. The Life Cycle Analysis Estimates BioFlex Hybrid Foams will save more than 50,000 barrels of oil per YEAR. I.L.D., Indentation load deflection, is measured by putting a 15 In. X 15 In. X 4 In. specimen of foam in an indentometer and measuring the weight required to push the foam down to 25%, 65% and back to 25% of its thickness. Therefore, an I.L.D. rating of 10 lbs. at 25% means that it takes 10 lbs. to compress the foam 25%, 65% I.L.D. compresses the foam 65% and will have a higher figure, then it is brought back to 25% and this is generally the right I.L.D. rating. These days I.F.D, Indentation force deflection, is sometimes used instead of ILD but means the same thing. DENSITY - Lbs. per cubic foot is simply the DENSITY of the foam and is not related to I.L.D. at all. You can have a high I.L.D. on a low density piece of foam and conversely a low I.L.D. on a high density foam. 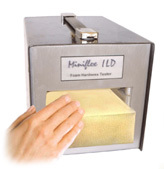 The higher the density of the foam, the better the quality and durability of the foam. I.L.D. 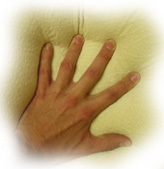 has nothing to do with the quality, it merely indicates the softness or the hardness of a piece of foam.